Electric Toothbrush vs Manual – Which is Better? Brushing your teeth regularly helps remove a build-up of plaque, which, in turn, helps prevent decay and unnecessary tooth filling. 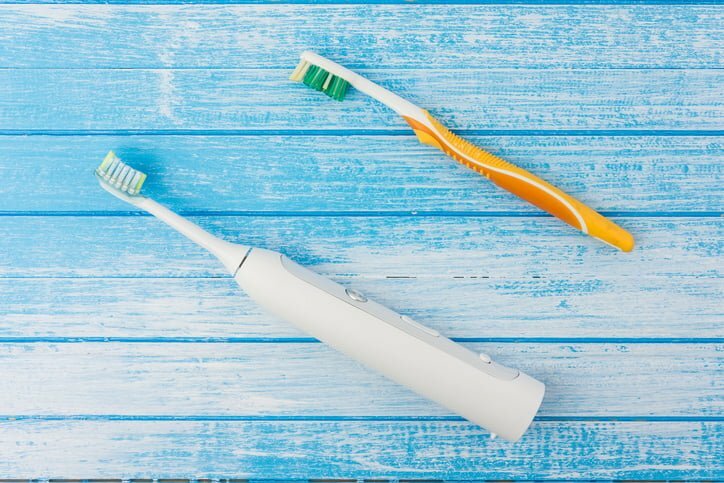 Finding the best toothbrush to do a good job is important, and often sparks a bit of a debate about whether you’re better off using an electric toothbrush or a manual one. • They have a small head which makes it easier to get to hard to reach places. • Some offer various speeds and timers that help you get the job done as effectively as possible. Some even have alarms that let you know if you’re applying too much pressure. • The novelty of the bright colours of some of them might help encourage kids to brush regularly and get into good dental habits. • The large handle can be helpful for people who struggle with fine motor tasks – for example those with arthritis or other fine motor control issues. • They need to be charged, and if you forget you’re a bit stuck. • They’re much more expensive than manual toothbrushes. • They’re bulky to pack when travelling. • They’re much cheaper than electric toothbrushes. • They offer a greater choice of head styles, sizes and some include tools on the back of the head for tongue cleaning. • The user controls the speed and pressure of the brush while cleaning their teeth. • Smaller and easier to pack when travelling and easily replaced if lost. • The wrong choice of head size and/or bristle type can mean users cause damage to their gums when brushing. • Larger sized heads can make it much more difficult to access hard to reach places in the mouth. • Not so easy to grip if the user’s hands are compromised by arthritis or some other issue. There are pros and cons to both options, and which brush you choose really comes down to personal preference. According to the Australian Dental Association’s oral health committee, there’s not a great deal of difference between electric and manual toothbrushes in terms of the job they do. The important thing is to use correct brushing technique and clean your teeth regularly. Whether you’re using a manual or electric brush, spend at least two minutes brushing, going over all surfaces of your teeth and remember that plaque forms at the gums, so you need to get right to the base of your teeth. If you’d like help with your brushing technique to keep your teeth healthy, ask us how at your next appointment. We can also assist with services such as laser teeth whitening to keep your smile looking its best.